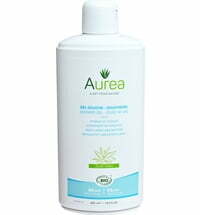 The Aurea product line contains natural and organic aloe vera gel from Italy! Pure, unrefined organic aloe vera gel in high forms the basis of this organic skincare line. Aloe vera regenerates the skin, nourishes and supplies moisture while unfolding its soothing effect on problematic skin as well as skin in need of care. 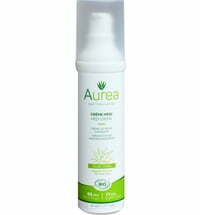 The Aurea product line carries both Cosmébio and ECOCERT certifications and is ideal for all skin types. Pure aloe vera gel is rich in vitamins A, B1, B2, B5, B6, C and E.
It contains several minerals such as iron, calcium, magnesium, zinc, copper, manganese and 18 different amino acids and enzymes. Antiseptic saponins with antibiotic, antiviral and anti-inflammatory properties is found in aloe vera. Aloe vera is known for its highly moisturising and nourishing effects, regulating the natural pH value of the skin. It accelerates collagen production which results in a firming effect. Oily and irritated skin as well as skin prone to redness is regulated. Aloe vera treats insect bites, atopic dermatitis as well as psoriasis. 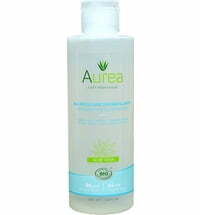 The highest amount of aloe vera was incorporated into Aurea cosmetics in order for its effects to unfold effortlessly.